Guatemala is the most populated country in Central America. The country’s name means “land of trees” in the Maya-Toltec language. Most Guatemalans live in the highlands, where the climate is temperate. The lowlands climate is quite hot. More than 50% of the Guatemalan people are descendants of the Mayans. The rest of the population is of Mayan and Spanish mixed ancestry. These Mestizo people are called Ladinos. The Ladinos generally speak Spanish, and wear regular Western clothes. The “Mayans” speak more than 20 native languages. They also hold on to the traditional clothes and customs. Guatemala also has a small percentage of black population. • The main rivers: Usumcinta, Motagua, Polochic, Sarstun and Dulce. • Guatemala has the second highest ozone concentration in the world. In 2010, the Gross Domestic Product (GDP) of Guatemala was nearly US $5,200 per capita. Agriculture is one of the major economic sectors in Guatemala (roughly 15% of the GDP). The Guatemalan labor force counts nearly 4.26 million people, and 50% of this labor force works in agriculture. The major agricultural products in Guatemala are bananas, sugarcane, coffee, corn, and meat. The agricultural sector also produces goods for export, including sugar, bananas, and coffee. Other Guatemalan export goods include meat, fruits and vegetables, and cardamom (the aromatic pods of a tropical plant, used as a spice). The main industries in Guatemala are textiles, furniture, sugar production, chemical industry, and tourism. Tourists love this country because it has an interesting history. The ancient Mayan civilization attracts many visitors every year. 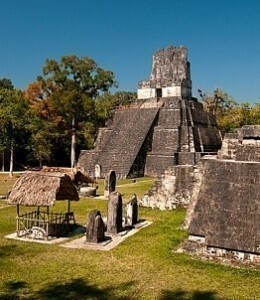 There are several UNESCO World Heritage sites in Guatemala: Tikal National Park, Ruins of Quirigua and Antigua Guatemala. One-tenth of the population is very rich. Nearly 60% of Guatemala’s population lives below the poverty line. 15% of these people live in extreme poverty. On average, almost 80% of the indigenous people – who make up 40% of the population – live in poverty. Nearly 30% of them live in extremely bad living conditions. The malnutrition rate is very high, and 45 % of children under the age of five suffer from chronic malnutrition. The Government has taken certain steps to improve the quality of life, but this process will take more time and efforts.